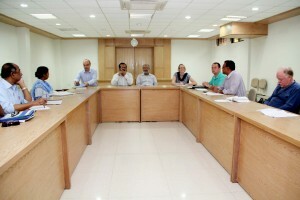 A high profile delegation of the Department for International Development (DFID) visited the Programmed Initiatives for Monga Eradication (PRIME) activities during 25-26 May 2014. 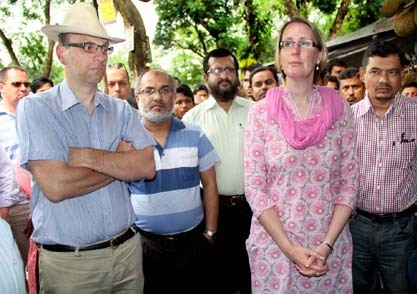 The delegation included Country Representative of DFID in Bangladesh Ms. Sarah Cooke, Chief Economist of DFID Mr. Stefan Dercon, Extreme Poverty Team leader Mr. Graham Gass, Team Leader of Private Sector Ms. Shahnila Azher, Senior Economic Adviser Mr. Stuart Davies, CLP Team Leader Mr. Matthew Pritchard. The team visited in a hard to reach ‘Manush Mara Char’ branch of RDRS in Chillmari Upazila of Kurigram district. The team was accompanied by the Deputy Managing Directors of Palli Karma-Sahayak Foundation (PKSF) Mr. Md. Fazlul Kader and Mr. Golam Touhid and General Manager Mr. A Q M Golam Mawla along with higher officials of RDRS Bangladesh. It may be mentioned that Since 2006 PRIME has been involved with the poverty alleviation of about 535,000 extremely poor households in 50 Upazilas of North-western and South-western region of Bangladesh. The delegation visited group activity of PRIME ultra poor households under Manush Mara Char branch of RDRS. They witnessed the Income Generating Activities (IGA) of PRIME members that includes perch system goat rearing, model homestead vegetable cultivations, vermi-compost, beef fattening, tailoring etc. They also observed on-going satellite clinic activity under the Primary Health Care Services of PRIME. Deputy Managing Directors of Palli Karma-Sahayak Foundation (PKSF) Mr. Md. Fazlul Kader and Mr. Golam Touhid and General Manager Mr. A Q M Golam Mawla elaborated the ongoing activities under PRIME and how it is reducing the vulnerability of the extreme poor in the environmentally and geographically challenged locations. The delegation also investigated household-level asset accumulation and collected evidences of economic progress of ultra poor households under PRIME programme. A follow-up discussion between the DFID delegation and PKSF was held about PRIME on 26 May 2014 in the RDRS Guest House. Mr. Md. Fazlul Kader shortly briefed about the PKSF and its integrated development programme for sustainable poverty alleviation. He enlightened on programmes support fund, special fund and disaster management fund which are disburse on flexible condition at the beneficiary end by partner organization (PO). He also pointed out that PKSF is now dealing with better access to education, health and other assistance to enhance household’s standard of life. This was followed by a presentation on PRIME by Dr. Sharif Ahmed Chowdhury, DGM (Livestock) & PC, PRIME. It covered progress of PRIME programme implementation and its impact on PRIME beneficiaries. Mr. Golam Touhid, Deputy Managing Director, PKSF; Mr. A Q M Golam Mawla, General Manager, PKSF and Professor M. A. Baqui Khalily, Executive Director, Institute of Microfinance (InM) and representatives of DFID also participated in the discussion.